Kathy E. Kram is a professor of organizational behavior and a distinguished faculty scholar at Boston University’s School of Management. Monica C. Higgins is an associate professor focused on leadership and organizational behavior at Harvard University’s Graduate School of Education. FINDING a mentor is not the solution to an executive’s career advancement, professional development, or satisfaction in contemporary work settings; nor is assigning formal men- tors to high potential employees the solution to building a high performance, learning organization. With today’s fast-changing technology, increasingly global, multi-cultural, and team-based work environments, no one mentor can possibly provide the guidance, exposure, and opportunities that are so essential to effectively manage current job challenges or prepare for future leadership roles. So, what is the alternative? Creating and cultivating a Developmental Network is a far better approach to insuring ongoing learning and growth— that group of individuals who have a genuine interest in your development and who are uniquely qualified to assist you in a critical aspect of your learning and development. The individuals who make up your developmental network may or may not know one another, and they may span several departments, organizations, and geographies. Importantly, we are not referring here to your entire network; this is not about everyone and anyone who helps you in your career. Rather, a developmental network is that sub-network of people–a small group, generally about five people in size—who you turn to for mentoring sup- port in your everyday life at work, a group you might think of as your personal board of directors. The point here is that these individuals have been enlisted by you to provide the mentoring functions that will enable you to take the next step forward, whatever that next step may be. Once you have learned the value of building and maintaining a rich developmental net- work for yourself, you will then be able to model and facilitate this for your employees as well. The purpose of this article is to propose an alternative to the search for the one best mentor. Reflecting this core idea that individuals can no longer rely upon one “mentor” in to- day’s work environment, we will use the term “developmental relationship” throughout this article. We illustrate why building an effective developmental network is a far better approach than finding one mentor who can provide all the necessary knowledge, guidance, and opportunities. In today’s complex, fast-paced, and global context, people’s work is dependent upon many, not a single person and further, no one person can determine your destiny or fulfill every development need. Research shows that networks provide information, access, and emotional support all of which or some of which may be im- portant to you2. Recognizing that a network made up of developmental relationships—high quality relationships that are characterized by mutual learning and mutual trust—are es- sential not only doing one’s current job but to preparing for future opportunities—is the first step. And, it is necessary, but not sufficient. The important next step is to consider whom to enlist, and how to build a developmental network that can meet your own career goals and is appropriate for your career context. If you are in a position to develop others, you can then build a culture that fosters developmental relationships and networks for individuals at every career stage. are important. Similarly, with an increasingly diverse and global workforce, the ability to work across cultural boundaries has become an essential competence. And, given the increasing number of technological choices regarding if, how, and when to communicate with others, individuals need to be particularly attuned to the implications of their own leadership style and how they communicate with others. Thus, opportunities to develop these “soft” skills are more essential than ever. Fortunately, these opportunities are more prevalent in organizations today—through leadership development programs, 360 degree feedback, and executive coaching. It is not sufficient, however, to have these emotional competencies. Individuals must also understand the value of creating and maintaining a developmental network—that is, actively enlisting a small group of interested developers who are responsive to the individual’s current developmental needs. We know from new research, that the structure and the com- position of one’s developmental network will significantly influence its value to the individual6. For example, a small low- diversity or homogeneous network may bring about loyalty, good performance, and promotion within some organizations, whereas a more diverse network may bring about movement from one organization to another, or one particular industry to another. The appropriate developmental network, from an in- dividual’s point of view should be grounded in what the individual is seeking as well as his or her work context. Finally, with this more complex view of mentoring, and the contemporary organizational context characterized by fast- paced technological change and a highly competitive global market, organizations must be more creative in their efforts to foster a mentoring culture. It is not sufficient to assign formal mentors to newcomers or to junior managers who have been identified as high potential7. Rather, it is in everyone’s best interests to create multiple opportunities for individuals to come together with their peers, juniors, and seniors to coach one an- other on similar job-related and career-related challenges, and for senior leaders to be engaged with less experienced leaders for the purpose of mutual learning. One-to-one exclusive mentoring will no longer be sufficient to support the scope and complexities of today’s strategic business challenges. Organizations that fail to attend to this relatively under-recognized need for relational learning will be at a distinct disadvantage. A number of organizations in both the private and public sectors are now using peer coaching, mentoring circles, and learning partners that provide good opportunities for individuals to build their own developmental networks. In one pharmaceutical company, product development team leaders come together in groups of 10-12 once a month to coach one another on how to address critical dilemmas that they face in this role. With training in coaching and group process skills, they have become important resources to one another, and, eventually, members of each others’ developmental networks. In a Consumer Products company, groups of junior executives have been meeting with a senior executive on a regular basis to discuss challenges they face as they seek positions of greater ex- ecutive responsibility. Here, these junior executives have opportunities to enlist one or more peers and a senior execu- tive in to their developmental networks. And, in a major urban school district, informal mentoring circles have been initiated for principals, which similarly provide opportunities for culti- vating peer developmental relationships. These initiatives are beginning to show results in critical measures such enhanced employee engagement and satisfaction, faster cycle times in new product development, customer satisfaction, and/or employee retention. The quality of develop- mental relationships is, indeed, a real source of competitive advantage. And, as current research shows, developmental relationships flourish in contexts that are characterized by a culture that encourages learning, collaboration and reflection8. While there is no sector or business context in which developmental networks are irrelevant, evidence today suggests that some con- texts may be more conducive to such networks than others. For example, in high-technology firms, and particularly start-up firms, the necessity to create learning relationships among peers is much greater, which increases the probability of collaboration and the cultivation of meaningful developmental relationships. In the financial services industry, and Investment Banking in particular, mentoring can be exclusively reserved for the very top performers, and is likely to be of a short term and instrumental nature. In this latter context, the emphasis on bottom line results and the pressures to meet ambitious, short term financial goals can undermine individuals’ capacities and willingness to build relationships that can provide substantive and lasting developmental support. In addition, developmental networks can be extremely valuable in the context of global and multicultural business environments. For example, the challenges that ex-patriots face as they move abroad, and then again when they return to their home country, can be met most effectively when the expat has a strong developmental network and the necessary relational skills to enlist others at various points during major career transitions. In these instances strong developmental networks can result in greater productivity, adaptability, and loyalty to the firm. Similarly, diverse developmental networks (in terms of the gender, racial and/or ethnic composition of the group of developers) can enable individuals to learn how to create positive work relationships with individuals of vastly different cultural backgrounds. What we propose here is a more intentional approach to building developmental relationships at work. Interestingly, despite the widely held belief that successful businesspeople are assertive, strategic, and eager to ask for help, our research suggests the opposite. That is, actively soliciting advice from others is not common practice among most professionals. Why not? Seeking out help places one in a vulnerable position, which is uncomfortable and also uncommon for those who are accustomed to having the right answer. Further, people often expect that others will already know what we need or should in fact know what we need9. Of course, we now know that ongoing learning and development is not a solo activity. Professional learning is dependent upon the career and personal support of others. Yet, oftentimes, we fail to engage others in the improvement of our own practice; we fail to cultivate mentoring relationships. Following, we offer several steps toward building an effective developmental network. It is critical for each individual to know him or herself well. Although this tip may sound cliché, it is also the case that when individuals do seek out help, they generally are not as well-prepared as they could be. Knowing oneself well, which includes one’s personal goals, strengths and weaknesses, as well as relational skills, can be tremendously useful to others who are trying to help you. Only with this self-awareness, will you be able to figure out who to turn to for developmental support in order to further your own personal and professional journey and only then, will you be able to appropriately respond to and engage in the developer’s suggestions effectively. Of course, as one’s career and life unfold, re-assessment will be necessary— as one grows and circumstances change, the developmental network of choice a few years ago will no longer be responsive. For example, after working in a large software company for twelve years, a young executive began to feel that he had outgrown the opportunities available to him. He had been promoted several times, and he had developed a strong developmental network that consisted of his boss, the Vice President of Marketing, several of his immediate subordinates in his own group, and one of his peers. This developmental network had served him well, enabling him to be a consistently high performer, and in turn, promoted several times. As he began to sense a poor fit between his career goals and what might be available at his firm, he had no one that he felt he could talk with about his new sense of being stuck. In time, he began to talk with his wife who became part of his develop- mental network as she listened and encouraged him to look outside the firm. Fortunately, this young executive had the wisdom to seek counsel and advice from others in the industry at other firms. He also chose to consult with an executive search firm that offered counseling services as well. While meeting with a career professional he began to see that he had not fully considered how his career goals may have evolved over time, and the full range of skills and experience that he had accumulated over the years. He realized that he had more work to do before developing a plan for moving forward. For some, it might not be necessary to go outside their organization to find opportunities to advance one’s career, but it is still critical to know yourself at this point in time, in terms of your preferences, talents, and personal vision for the future. Only then are you in a position to enlist appropriate others in to your developmental network who can truly help you realize your intentions. Fortunately, many organizations offer a range of activities designed to help an individual complete a thorough self-inquiry including leadership development programs, 360 degree feedback processes, coaching, and a variety of career assessment tools. While you may be very clear about what you want to achieve, you may also discover that your self-reliance to this point leaves you without the relational skills and relational savvy necessary to build a developmental network that is responsive to your current needs10. So, part of your self-knowledge should include an assessment of your relational skills–such as your propensity to reach out for help, your ability to identify potential developers, your capacity to initiate conversation with individuals who do not know you, and your openness to sharing your own experiences, inviting feedback, and to establishing a connection of mutual trust and respect with another. If you need to strengthen any of your relational skills and/or your self-confidence, consider what you can do to develop this foundation of self-knowledge and emotional competence as you begin developing your developmental network. Sometimes, current developers can be sources of insight and support as you hone these critical relationship building skills. It is also critical to think through the context in which you are currently working and, if you are planning a career change, where you’d like to go. That is, it makes little sense to build a developmental network that is inappropriate for the work you want to do. As the chemist in a biotechnology firm, for example, it makes sense, if your goal is advancement, to understand how the promotion process works and, importantly, who, among the potential sponsors in your organization, might be open and keen on coaching you. In the case of the sector- switcher, it would be useful to understand how hiring is done in this new sector as well as the kinds of information and sources you would need to tap into in order to assess if and when to make a career change. Then, if such a move makes sense, as a sector-switcher you would need to develop relation- ships with individuals who will be able and willing to introduce you to people already working in the area that you aspire to join. One way to think of this is as an opportunity audit. Knowing yourself is one half of the equation. The other is knowing the opportunity structure for where you want to go. Whether it’s balance, promotion, or change that you seek in your career, there are different kinds of advice and coaching that you will want to seek out. Further, there are different ways in which you can go about that. The more prepared you are about who and what you need help on, the more thoughtful and potentially rewarding the developmental network you build is likely to be. Individuals who want to change firms, or change industries, run the risk that they do not have an accurate understanding of the context and job characteristics of their newly articulated aspirations. Without the benefit of connections with one or more individuals who are already working in the new job, organization, or industry, it is quite likely that your assumptions about what it will be like to make the move may be faulty or at best incomplete. This is true even for individuals who want to stay in their current organization but who seek to broaden or dramatically change the focus of their work. Research on career transitions indicates that the best way to obtain an accurate understanding of the unknown context and its potential fit with your personal values and goals is to develop a clear picture of the “possible selves” that you might become11. Here the primary task is to actively enlist individuals in your developmental network who have the potential to provide the critical help that you need to advance your personal goals. If you are a product manager in a large technology firm and as- pire to reach a higher position, then you will want to develop alliances with individuals at more senior levels who can sponsor and promote you, coach you, and serve as a role model of what it takes to prepare for their level of responsibility. This, however, is not sufficient. What about peers in your immediate area and outside your area who can help you learn to navigate the politics, and who can share information about those at more senior levels? What can you offer to these peers? And, are there individuals outside of your employing organization who can support your continuing learning? From graduate school? In professional organizations? In your family? The young man- ager who focuses entirely on the senior mentor who can create challenging opportunities within the current organization, is limited in the kind of developmental support s/he is likely to receive. The director of business development in a high-technology firm who similarly seeks promotion is likely to need a developmental network of a different sort, given the boundary- spanning nature of the work he does —one that includes peers and seniors both inside and outside the firm. For others, seeking out extraorganizational developmental relationships may be just the kind of help she needs to make a career change. Indeed, the greater the diversity of the network, the more cognitively flexible or open-minded she is likely to become during the process12. And, if she senses that opportunities are limited for senior women who are high achievers in the field she’d like to move to, then she will also benefit from enlisting other women in her developmental network—to reality test her perceptions of the playing field, and to enrich her strategies for continued growth and advancement. The CEO/founder who now seeks greater life balance is likely to benefit from stronger connections that provide psychosocial support. These may come from within the place of employment giving him that support during the day (e.g., for lunch or a workout) or they may come from a professional net- work, people he can easily turn to outside his company. It may also be that enlisting junior colleagues will provide a new vehicle for personal growth and satisfaction as he mentors them and passes along his accumulated wisdom and experience. Finally, the executive who has been asked to take an expatriate assignment for a two to three year period will want to enlist people at home and abroad who can help educate him about what he is likely to encounter in the new role and new cultural context. These early additions to his developmental network may then give way to other relationships that become relevant to his success in the expat assignment once he has settled into his new context. And, if he is bringing his family along, he may want to enlist other expats in the host country to help the family transition as well. Since such an assignment is of limited duration, it will be important to maintain and/or re- engage particular relationships that dominated his developmental network prior to being chosen for the expat assignment. So, what does it mean to proactively build and modify your developmental network? Can you create the specific opportunities to enlist new developers in to your network? Here is where an appreciation for the potential mutuality in relation- ships with developers is critical. By this we mean that you should approach prospective developers with a sense of how they might benefit from an active association with you. What might they learn from you—new skills? Might they develop insight in to how people in your job or position see the world and prioritize what is important? Might it be an opportunity for a developer to hone his or her coaching skills, or to develop confidence in mentoring others? Having a clear sense of these possibilities will make it easier for you to empathize, ask rele- vant questions, and disclose information about yourself as you ask for guidance that will facilitate meaningful connections and, in turn, mutual learning and development. As we compare networks of successful executives, it is clear that as one’s career unfolds, the ideal developmental network changes as well. The executive who decides that her current employer is not a good fit with her professional aspirations will be best served by enlisting individuals in other settings who can open doors to different career possibilities. Relying on the developmental network that was created to help her change jobs is a network that can provide advice and support for and during transition. But this is unlikely to be the kind of developmental network she needs to become socialized into the new work environment. Over time, then, her developmental network will need to change13. At some point, for example, a new executive is no longer a novice in his or her role and so, may need to look elsewhere for support to continue learning. If she is to continue to advance, she will need to consider who else to enlist in his developmental network. For example, if future leaders of the firm are expected to coach newcomers and to develop talent for the organization, it may be time to bring one or more junior colleagues in to one’s developmental network so that opportunities to grow in to the coaching role are readily available. Similarly, if there are technical areas that are still unfamiliar and a prerequisite for moving in to a position of broader scope, this would be the time to seek relationships with peers and projects that require learning more about new areas of the business. And, if the executive is of a different cultural back- ground than the white majority, or female in a male-dominated organization, it will be beneficial to enlist developers of a similar background or identity group (either peers or seniors) who can help in strategizing for success. For the CEO/founder, a number of possibilities may have become apparent through a broader developmental network that brought him in to activities in the community, with one’s family, or with new business opportunities. What are the next steps for moving towards new options that promise a new sort of balance? Who are the individuals who can guide movement in to these new domains? How can family members and mem- bers of his community become important sources of developmental support? Alternatively, the CEO/founder may see a need to enhance leadership diversity in his or her top team; an important strategy for achieving more diversity in ex- ecutive positions is to build developmental relationships with individuals of diverse backgrounds who can help you under- stand how the organization can foster development for a more diverse group of potential leaders. We are not suggesting that as one’s career unfolds that prior developers are no longer relevant, but rather that your focus and your relationship-building efforts may need to shift if your developmental network is to continue to support your learning and growth. While this may sound calculating and borderline manipulative, our research indicates that individuals who invest their time and energy wisely and consistently, in ways that serve their personal goals as well as the goals of their organizations, attain greater satisfaction and performance levels. Relationships with prior developers transform in to friendships, or more distant alliances, and are now valued in a different way. Just as one needs to create a personal vision in order to prioritize actions in a resource constrained reality, so does one need to create a vision for one’s developmental net- work to insure that actions taken to support one’s growth and development are maximized. It’s a matter of being more inten- tional when it comes to seeking out advice, and this is relevant for everyone, at every career stage, not just–as the myth often perpetuates–for those just starting out in their career. When considering how to build your own developmental network, it is important to underscore the point that what you are seeking is high quality mentoring, in contrast to average or marginal mentoring, which is more akin to superficial “net- working” than to creating meaningful developmental relationships at work). 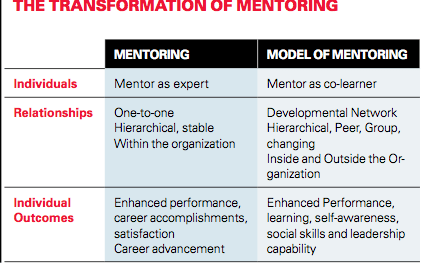 High-quality mentoring is characterized by mutual learning, wherein both partners to a relationship experience increased sense of work, new knowledge, a sense of empowerment, increased zest, and a desire for more connection. gain new knowledge from you, to hone coaching skills, and to experience a new connection that, at its best, results in in- creased learning and enthusiasm at work. Similarly, as you enlist a junior colleague in your developmental network to hone your coaching skills, you are creating an opportunity for this particular individual to bring you in to her developmental network. Exploring these complementary personal goals can solidify the relationship and lead to positive outcomes for both of you, and in turn, for the organization. In essence, we are urging you to consider your develop- mental network as a critical tool for developing others, your organization, as well as yourself. This is a fundamental shift in perspective from a traditional expert model of mentoring to a developmental network model of mentoring in which both individuals are co-learners. This new frame is relevant to both you as an individual and to your organization. Your intentional ef- forts to sustain a rich and responsive developmental network will serve your colleagues’ development as well. The potential for synergy is great—enlisting others in your development leads to developmental opportunities for those individuals as well. As high quality developmental relationships proliferate in your organization, there will be ample opportunities for others to enhance their own learning and performance as well. Thus, there are many ways to foster developmental net- works in your organization. Certainly, wherever you sit, your behavior serves as a role model for others—your peers, subordinates and seniors. Second, if you are in a position to encourage peer coaching and mentoring among those that you manage (via department meetings, task forces, performance appraisal processes and rewards, etc.) you can create opportunities for peers to enlist one another in their developmental networks. Finally, there are leadership development pro- grams—public offerings and tailored within—that help individuals to develop the essential relational skills and self- awareness to actively and effectively enlist new developers in to their networks. In the context of such programs, there are opportunities for peer coaching and mentoring, which, once initiated, may then be cultivated and sustained back on the job. If you are discerning about the value of your current developmental network and take action to strengthen its value to you, you will, at the same time create opportunities for those who you enlist to enhance their own developmental networks. Ultimately, these developmental networks can be leveraged to serve organizational performance and development as well. It is, in essence, a win-win proposition for you and for your organization. 1. The concept of developmental network was first articulated in M. A. Higgins and K. E. Kram, “Reconceptualizing Mentoring at Work: A Devel- opmental Network Perspective,” Academy of Management Review 26, no. 2 (2001): 264-298. Since then, many scholars have refocused their work from the study of traditional mentoring relationships to the study of developmental networks. For an overview of the most recent theory and research, see B.R. Ragins and K.E. Kram, “Handbook of Mentoring at Work: Theory, Research, and Practice” (San Francisco: Sage Publications, 2007). 2. There has been a flourishing of articles about social networks, and the various functions that these can serve. See, for example D. J. Brass, J. Galaskiewicz, J. Greve and W. Tsai, “Taking Stock of Networks and Orga- nizations: A Multilevel Analysis,” Academy of Management Journal 47, no. 6 (2004): 794-819. See also, H. Ibarra, “How Leaders Create and Use Networks,” Harvard Business Review 85, no. 1 (2007): 40-47. What we are focusing on here are those subsets of social networks that are primar- ily focused on supporting the learning and development of the focal person who sits at the center of a developmental network. 3. For a review of how the career context has changed see H. Gunz and M. Peiperl “Handbook of Career Studies” (Thousand Oaks, CA: Sage Publications, 2007). 4. See P. Parker, D.T Hall and K.E Kram, “Peer Coaching: A Relational Tool for Accelerated Career Learning,” Academy of Management Learning and Education, 2008, Vol. 7, No. 4, 487–503.. Also see S. McManus and J. Russell “Peer Mentoring Relationships,” in “Handbook of Mentoring at Work: Theory, Research, and Practice” ed. B.R. Ragins and K. Kram (Thousand Oaks, CA: Sage Publications, 2007), 273-298. 5. See D. Goleman “Working with Emotional Intelligence” (New York: Bantam Books, 1998). Also see C. Cherniss “The Role of Emotional Intel- ligence in the Mentoring Process” in “Handbook of Mentoring at Work: Theory, Research, and Practice” ed. B.R. Ragins and K.E Kram (Thousand Oaks, CA: Sage Publications, 2007), 427-446. 6. See M.C. Higgins and D.A. Thomas, “Constellations and Careers: To- ward Understanding the Effects of Multiple Developmental Relationships,” Journal of Organizational Behavior 22, no. 3 (2001): 223- 247; S.R. Dobrow and M.C. Higgins, “Developmental Networks and Professional Identity: A Longitudinal Study,” Career Development Inter- national 10, no. 6/7 (2005): 567-583; and M.C Higgins, “A Contingency Approach to Developmental Networks,” in “Exploring Positive Relation- ships at Work” ed. J. Dutton, B.R Ragins and N.J. Mahway (New Jersey: Lawrence Ehrlbaum, 2007). 8. See D.T Hall, ed., “The Career is Dead: Long Live the Career” (San Francisco: Jossey Bass, 1997), for a discussion of developmental cul- tures and the importance of a relational approach to career development. 9. See P.H. Claman, “Ask: How to Get What you Want and Need at Work” (Boston: Insights, 2002), for a discussion of why individuals refrain from seeking help, and the actions they can take to be more proactive in this regards. Also see M. Higgins, D. Chandler and K. Kram, “Develop- mental Initiation and Developmental Networks,” in “Handbook of Mentoring at Work: Theory, Research, and Practice” ed. B.R. Ragins and K.E Kram (Thousand Oaks, CA: Sage Publications, 2007), 349-372. 10. For a discussion of the relational skills necessary to building high qual- ity mentoring relationships, see J. Fletcher and B.R. Ragins, “Stone Center Relational Cultural Theory: A Window on Relational Mentoring,” in “Handbook of Mentoring at Work: Theory, Research, and Practice” ed. B.R. Ragins and K.E Kram (Thousand Oaks, CA: Sage Publications, 2007), 373-400. Also see D.E. Chandler, “Relational Saavy: Why some Proteges are More Adept than Others At Cultivating and Nurturing Developmental Relationships” (Ph.D. diss, Boston University School of Management, 2006). 11. For further discussion of the importance of exploring “possible selves” when making a career transition, see H. Ibarra, “Working Iden- tity: Unconventional Strategies for Reinventing Your Career” (Cambridge, MA: Harvard Business School Press, 2003). 12. See M.C. Higgins, “Career Change: The Effects of Social Context,” Journal of Organizational Behavior 22, no. 2 (2001): 595-618. 13. See M.C. Higgins, “Developmental Network Questionnaire” Harvard Business School case no. 404-105 (Boston: Harvard Business School Publishing, 2004) for an assessment tool that one can use to clarify the structure and make up of one’s current developmental network as well as one’s desired developmental network. copyrighted by the Massachusetts Institute of Technology. (9 a.m.-5 p.m. ET) at the phone numbers listed below. Posting of full-text SMR articles on publicly accessible Internet sites is prohibited. To obtain permission to post articles on secure and/or password-protected intranet sites, e-mail your request to smrpermissions@mit.edu. articles and selected free content at www.sloanreview.mit.edu. Hyperlinking to article abstracts or free content does not require written permission.